After witnessing so many great carvings in Woodcarving that have been crafted with more than a little help from a flexi-drive or a Dremel, I decided to take the plunge and join the power carving club. My first opportunity to try the Dremel was in renovating a raised scroll that had broken off the bracket for our piano. After setting a block and roughing-out the rising scroll, I used the sanding drum and the carbide burr to great effect, blending in the block and removing excess glue. I tried each of the bits in the flexible drive chuck, as well as directly in the tool, and found the drive better in both instances because of better handling and easier access to the work - restraint however, was the order of the day since it was all too easy to take off more than I intended. 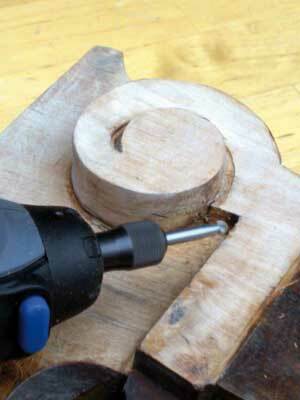 I practised on a spare piece of wood before tackling the scroll itself. 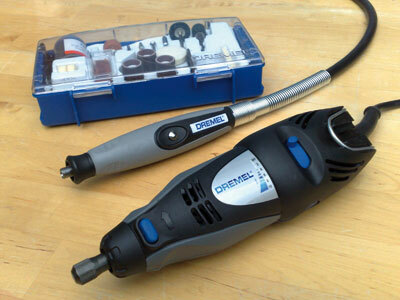 The Dremel 300 has variable speed setting from 10,000-33,000 rpm, delivered by a 125W motor. Bit changing is trouble-free with the chuck using a split collet system, similar to routers, which guarantees a well-set bit without vibration. The motor is also noticeably quieter than a cheaper tool that I borrowed for comparison. 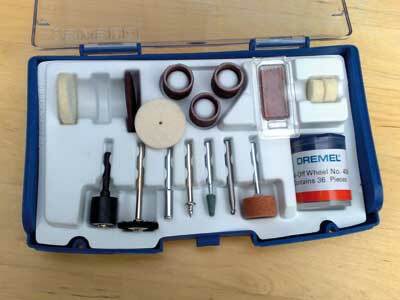 The 50 accessories supplied with this kit are not aimed at woodcarvers and so you'll need to consider buying-in additional high-speed cutters, other than the burr shown in the main photo, and some additional sanding discs or drums. The other accessories that are supplied are good for a great many jobs around the home and in the workshop, but if you don't want these metalworking etc bits, you can simply buy the kit you do want separately. Prices for accessories are pretty reasonable - from around Â£2.40 for 36 sanding discs to around £1.30 for six sanding drums. Spare parts are also easily available. This is a high quality piece of kit which, if maintained properly, should last for many years. "This is a high quality piece of kit"